The ACT is a curriculum-based achievement test that measures what a student has learned in school. This standardized test is accepted by all four-year colleges and universities in the U.S. and helps them evaluate candidates. The ACT can be taken with or without the writing portion. To determine if you need it, find out if the colleges you're applying to require it. When you register, you can opt into ACT’s Educational Opportunity Service, which will connect you with financial institutions and colleges based on your interests and future plans. Be sure to print out your ticket to the test center after you register, as you'll need it to take the ACT. The ACT can be taken as early as grade six. However, most students take the test for the first time during the spring of their junior year. Scores are provided anywhere from two to eight weeks after the test. Those unsatisfied with their scores will then have enough time to retake the ACT during the fall of their senior year. Depending on when you're planning to take the ACT, it's never too soon to begin the prep process. However, the majority of students take their preparations more seriously in the spring and summer before their junior year. If you do the same, you'll be ready to take the test in the spring of your junior year. This plan also gives you enough time if you want to retake the ACT in the fall of your senior year. The ACT is directly related to the high school courses you're currently taking — English, math, reading and science. As you attend classes and work hard to excel, you're actually preparing to do well on the ACT. 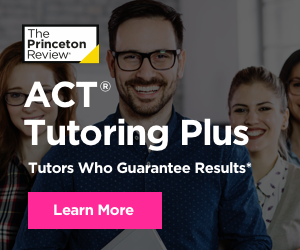 However, to get a top score, you'll want to turn to the trusted results provided by The Princeton Review. You can take our free practice test online . After that, we'll give you your personalized report that lets you know which areas you're strong in and which areas need improvement. The best way to prepare for the test is to sign up for our ACT Prep course . Our team has over 35 years of experience teaching the ACT and can ensure you get the maximum results in a minimum amount of time. Come early the day of your test. The center opens at 7:45 a.m., and doors close promptly at 8 a.m. If you're late, you will not be admitted. Once you break the seal on your booklet, the test has begun. There are four separate tests covering English, math, reading and science, as well as a fifth test that helps develop future ACTs but is not reflected in your score. After the first two tests, you'll be allowed to leave the room for a short break. During this time, cell phones and other electronic devices are still prohibited. Once the test administrator collects all the test booklets, students are dismissed. If you took the ACT® with writing, multiple-choice scores are posted first, and your writing scores will be posted online as soon as they are ready. *No test centers are scheduled in New York for the February test date. **No test centers are scheduled in New York or California for the July test date. For more information regarding ACT score release dates, please visit www.act.org. Confirm ACT dates and get information on ACT test registration today! You can also call 319-337-1270.